Actors are performing artists who portray characters on stage and in television shows, commercials, movies, and shows at amusement parks. While it is not a gender-specific term—both males and females in this occupation are called "actors"— the word "actor" is often used when talking about a male while "actress" is used to describe a female. Actors are artists, but the art is made up of many smaller skills that can be learned and practiced. Like many trades, preparation is a big part of success. To really embody a role and convince a casting agent that they are right for the part, actors need to study the characters they hope to portray. This is more than just reading the script and memorizing lines. It’s about understanding what motivates a character and why a character behaves in a certain way. This preparation and the resulting performances in auditions are just part of the job. Actors also must work with an agent at finding the right roles and opportunities. And when actors finally do land a job, they need the skills to be able to collaborate effectively with fellow actors, the director, and other members of the crew. Pay for actors varies greatly, and the number of hours any one job might entail might vary even more. Some jobs pay barely more than minimum wage, while some others provide a great deal more than that. Top film and television actors can make millions, but they are the exception to the rule. Actors typically need some kind of formal education, whether it be a degree in theater or drama or regular acting classes. Training in other areas relative to performing also is beneficial. Education: Formal training doesn't necessarily mean college. A bachelor's degree in theater or drama is one option, but acting or film classes at a community college, theater company's acting conservatory, or film school also is a good option for some actors. Training: In addition to gaining acting experience, it’s beneficial for actors to be trained in skills that can be useful. These can include singing or other vocal training, dance lessons, martial arts, and much more. Having the right skills is what sometimes gets actors in the door for an audition. Acting is both a skill and an art, and being good at it requires some soft skills that can help make performances seem as real as possible. Active Listening: Actors need to be able to respond to other actors in the moment, while in character. They also need to respond to what a director wants. Verbal Communication: Acting involves collaborating, and that sometimes means conveying to others details about a scene or a performance. 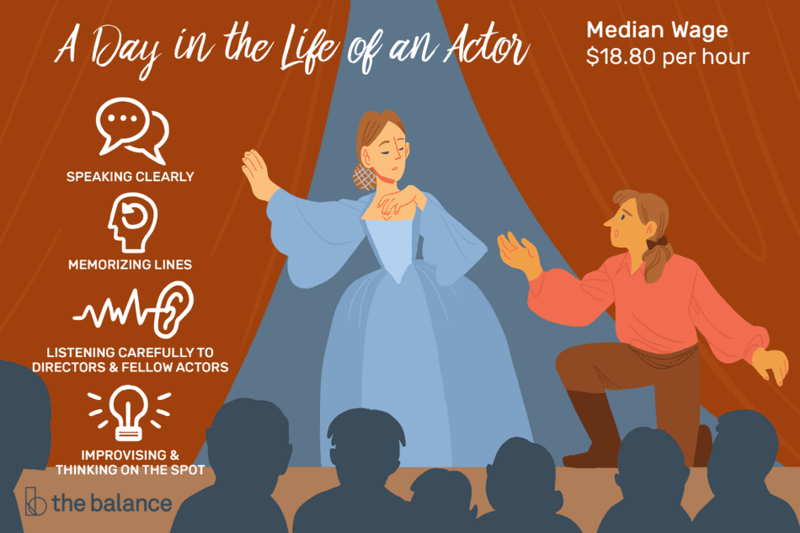 From a practical standpoint, actors also need to be able to enunciate clearly so other actors and audience members can hear them and understand them clearly. Creativity: Writers might have an idea for what a character should be, but actors need to bring it to life. To find what motivates a character, actors sometimes need to come up with a backstory, if only for their own benefit. Memorization: Actors must be able to memorize lines. Persistence: This is a competitive field, and actors have to repeatedly audition and deal with rejection. Jobs for actors are projected to grow at 12 percent for the decade ending in 2026, according to the U.S. Bureau of Labor Statistics. This is significantly better than the 7 percent growth projected for all occupations. That does not mean jobs will be easy to get. While more jobs may be available, auditions for available roles still are fiercely competitive. Film actors are expected to see much better growth than theater actors. While new streaming services are increasing the number of straight-to-internet movies and shows, many local theaters still struggle to stay funded. Work environments can vary greatly. Working on stage is different from working in front of a camera, and actors working in front of a camera might be in a studio or on location in extreme weather. Some actors might work in other environments, such as theme parks or other themed attractions that include characters. Actors need to be able to collaborate effectively with other actors, directors, and various members of a shoot or production. Actors only work full time if they have a regular role in a television show or are part of a long-running stage production. Even then, full-time work is only temporary. When they are working, actors’ schedules can be unpredictable depending on shooting schedules. Long days are common, and it’s not unusual for films and television shows to shoot at all hours depending on the needs of a scene. Even the smallest role in a community theater production is better than sitting at home by the phone. Expect many rejections. Learn from them, but don’t dwell on them.